The auxiliary flying field at Waimanalo Military Reservation, Territory of Hawaii, is designated as Bellows Field in honor of Second Lieutenant Franklin B. Bellows, 50th Aero Squadron. Lieutenant Bellows was awarded the Distinguished Service Cross for extraordinary heroism in action near St. Mihiel, France. He was killed September 13, 1918, while performing a reconaissance mission. Franklin Barney Bellows was the son of John Austin Bellows and Cora Barney Bellows. He was born in Evanston, Illinois on 9 July 1896. He received his early education in the grammar schools of Evanston and Kenilworth, Illinois, then graduated from the New Trier High School in 1913 and from Northwestern University on 13 June 1917. When war was declared between the United States and Germany, Bellows was just one month short of graduation from the university. He volunteered in the service of his country and entered the First Officers’ Training Camp at Fort Sheridan, Illinois on 13 May 1917. A month later, he graduated from the university, the only member of his group to receive his diploma in uniform. He then transferred to the Training Camp for Coast Artillery at Fortress Monroe, receiving his commission as a second lieutenant in the Coast Artillery on 15 August 1917. A few months later, he responded to a call for volunteers for the air service, reporting to the University of Texas at Ausin to attend the School of Military Aeronautics. On 12 February 1918, Franklin was commissioned a second lieutenant in the Aviation Section; however, he also retained his commission in the Coast Artillery. On 15 August, he received orders to go to the front, where he was assigned to the 50th Aero Squadron. Early in the morning of 13 September 1918, he departed with 2nd. Lt. D. C. Beebe, the pilot on a reconnaissance mission over the lines for the 82nd Division of the 1st Corps, First Army, in the Saint Mihiel section. While flying over enemy territory at an altitude of more more than 300 meters because of low-lying clouds, their aircraft received machine gun fire and anti-aircraft fire from the ground. 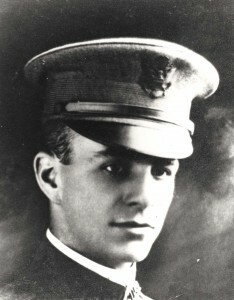 Lt. Bellows was hit three times by machine gun bullets, which caused his death a few minutes later. Lt. Beebe succeeded in returning safely to the rear of the allied lines, landing at Brin northeast of Nancy.